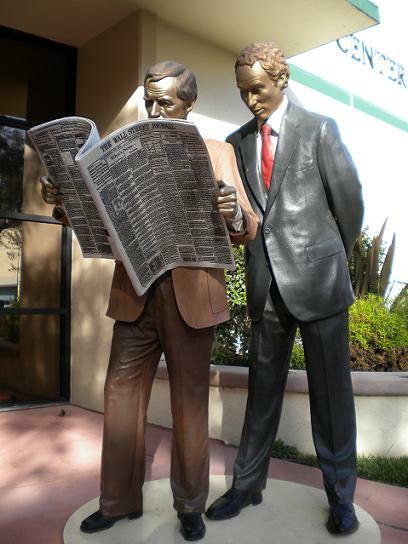 This statue at Western University of Health Sciences in Pomona — “Second Hand News,” by J. Seward Johnson — was a heartening sight on a recent visit to the campus, even though the second guy should really buy his own newspaper. All of us in the biz could use the help. At the Daily Bulletin and its sister newspapers, we learned last week our salaries will be cut 5.5 percent, permanently, on top of furloughs, a wage freeze and a vacation freeze. Read more here. Economic recovery? Not in our industry, or among our advertisers. Still, things are tough all over. If you’re unemployed or underemployed, we feel for you. We also print a lot of news, bad and good, about the economy. And don’t forget, we publish help wanted ads too. David, I’m so sorry to hear this. I wish I weren’t in such good company. I am so sorry to read this has happened to my favorite columnist. When you just got a kick in the stomach, you need to keep on going. We need you and your column. Humor must be kept on hand.